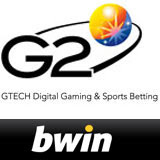 bwin will be among the first GTECH G2 licensees to offer the new Casino Dice mini-game developed by GTECH G2’s subsidiary, Dynamite Idea. Both the new Casino Dice and the popular Triple Chance Hi Lo are now offered in full, mini and mobile versions at bwin and will soon be available at other GTECH G2 powered online casinos and gaming suites. Casino Dice is a single number draw game where players try to predict the roll of a pair of dice. When players correctly predict the combined total of a pair of dice, they win and get a chance to double their money. Casino Dice was developed by the games designers at Dynamite Idea, one of four leading digital gaming companies acquired by lottery industry giant, GTECH to form GTECH G2, their new interactive gaming division. The Dynamite Idea team specializes in developing innovative online interactive betting games including several unique hi lo, dice and number games. In addition to the new products in its suite of mini-games, GTECH G2 is also adding two new games to their Boss Media download casino. Keno Cash and 4Play Hi Lo Bingo will now be included in the downloadable games at online casinos such as Casino-Club.com, PokerHeaven.com and Virgin Casino.